Chef’s Note: In order to properly serve four people, let your butcher know that you would like a rack of lamb with eight bones and ask him to trim and prepare it for you. Remove rack of lamb and prepare the marinade. 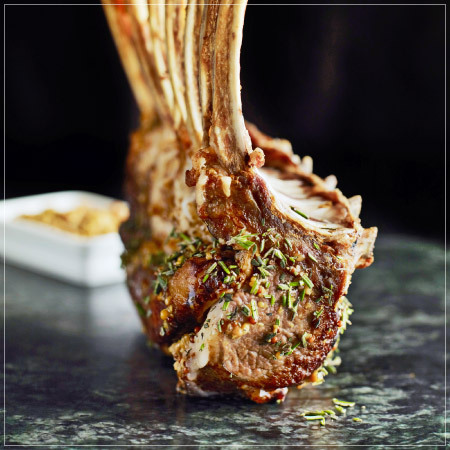 If you possess a Cryovac or FoodSaver, place the rack of lamb in a vacuum-seal bag, and add the smashed garlic cloves, rosemary sprigs, olive oil, and lemon zest. Vacuum and seal bag and refrigerate for two hours. As an alternative method, place the meat and marinade ingredients in a large Ziploc bag, pressing out as much excess air as possible and refrigerate overnight, or for a minimum of two hours. Rinse measured barley in a fine sieve until the water runs clear, then allow the barley to drain for two to three minutes. In a small pot bring the chicken stock to a simmer, while heating two tablespoons of olive oil in a medium-sized pot on medium heat. Add the shallots and sweat for one minute, before adding the barley. Cook, stirring, for two minutes. Add the white wine and continue to stir until the wine has fully reduced. Cover the barley with three cups of chicken stock and cook on medium-low heat for 20 minutes, stirring occasionally. The barley should begin to plump up and soften. Add the final cup of chicken stock and continue to simmer for another 20 minutes. Stir occasionally. Heat a large sauté pan on high heat and add one tablespoon of olive oil. Stir in the chanterelles and season with salt, pepper and thyme. Cook for four minutes, or until the mushroom edges become golden. Set aside. When the barley is tender to the bite, keep heat on low and add the parmesan. Add three tablespoons of butter and the chanterelles. Season with salt and pepper, and set aside. In a medium-sized mixing bowl add baby kale and purple cabbage. Season with salt and pepper plus two tablespoons of lemon vinaigrette. Taste and adjust seasoning as desired. Pre-heat oven to 350 degrees. Remove rack of lamb from marinade and bring to room temperature for 20 minutes. Season generously with kosher salt. Heat a large cast-iron or stainless-steel pan on medium heat. Add one tablespoon of grapeseed oil to the sauté pan, then place the lamb rack fat-side down. Cook for five minutes, adjusting heat to medium-low. Place the lamb in the oven, with the fat-side facing up. Roast at 350-degrees for eight minutes. Insert cooking thermometer in the center of the rack; a medium-rare temperature should be around 125 to 130 degrees. Allow the meat to stand for five to ten minutes, before cutting each rack into four double chops. Gently place a double chop onto four individual plates, with the chanterelle-barley risotto and kale-cabbage salad served alongside. 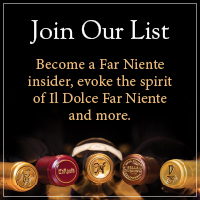 Pull the cork on a bottle of beautifully aged Far Niente Cabernet Sauvignon and enjoy!